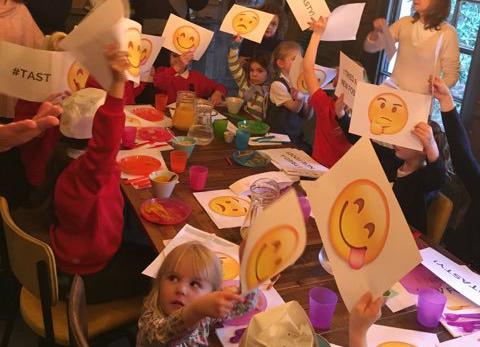 WHY SHOULD YOU CHANGE OR OFFER A CHILDREN’S MENU? Obesity statistics in children are at an all-time high and because of this, through no fault of their own, many children face a future battling life-threatening illness. As the foodie culture grows in the UK and the government continues to push the healthy eating agenda, parents are becoming more selective about the food they choose to feed their children. A recent survey conducted by Dotty’s Kitchin revealed that most parents feel that children’s menus lack imagination and vegetables and rely too heavily on processed, frozen foods. At Dotty’s Kitchin we know that the way to get kids interested in healthy eating is by making it fun, interactive and yummy! WE OFFER SMALL PORTIONS OF ADULT FOOD, ISN’T THAT BETTER? Your adult menu isn’t designed with children in mind. The food is often too high in salt, unfamiliar and does not consider little ones’ taste buds, so parents default to the only food they know their child will eat, which is often low in nutritional value. Not offering a children’s menu could be deterring families from coming to your eating establishment. Families often perceive that children may not be welcome in an establishment if a children’s menu is not on offer. WHY DON’T I WRITE THE MENU MYSELF? WHY SHOULD WE WORK WITH DOTTY’S KITCHIN? I understand for any business, financial viability is of paramount importance and of course you could design the menu yourself. However, having worked with restaurants, chefs, parents and fussy eating children there is more to consider than simply providing a healthy children’s menu. Parents don’t want to pay for food that gets wasted and results in upset children. That’s where Dotty’s Kitchin expertise comes in! We have experience and a successful strategy when it comes to creating healthy meals that kids love! Working with Dotty's Kitchin provides you with so much more than just peace of mind that children and parents will love your new menu. We work with your chefs to create menus that reflect your business and work for you and your customers. Your success is our success, so we work with you to promote your business and the great work you’re doing to inspire parents and children to LOVE good food. Make a difference and contact us today to discuss your unique business.